Who does earth owe money to? The earth goes further and further into the debt. Even the GFC didn’t cure us of our credit addiction. Where will it all end? Apparently the earth is now $200 trillion dollars in debt. And Jupiter is coming to collect. It’s a funny statistic, and it’s strange to think about the whole world being in debt. But this is how the global economy works. But we’re not borrowing from other planets. There’s no line of credit from the Bank of Venus. We’re borrowing from ourselves. You’ve got to admire human ingenuity. We’ve constructed a system where we can draw down future production and earnings, and spend them in the present day. This is the basics of the lending model. I’ll lend you $1 today, if you give me $2 tomorrow. And in the modern era, everyone’s in on it. Banks are lending to governments. Governments are lending to households. Banks are lending to non-bank financial institutions. Credit is the oil of the capitalist machine. Not necessarily. Personally, I’m a big fan. My fortune has been built on leverage. If I had to buy my first property outright I’d still be saving for it. Who’d be writing these blogs then? And credit, as a tool in the modern human’s tool kit (up there with the wheel and agriculture) has allowed us to enjoy a far greater level of prosperity that would have otherwise been possible. And with that, it has helped raise millions of people out of poverty – and the misery, disease and death that come with destitution. But of course, not all debt is the same. We can understand this at a household level. Borrowing to buy a shiny new stereo is not the same as borrowing to invest in an income-producing asset like property, or even to invest in your own skills – like a Uni degree. One type of borrowing sets your future-self up with greater earning potential to pay back the debts you owe. The other leaves your future-self grumbling about how you always get it in trouble. Same story with government debt. There’s a role for borrowing to build the productive capacity of the economy. Investment in infrastructure, roads, communications etc. can all build the economic potential of the future. This potential, realised through increased tax revenues, can make it a positive proposition for the government just on purely economic grounds. But borrowing to throw pork at the electorate or bribe them off with tax-cuts does nothing to build national wealth. It’s an entirely different story. And there’s good and bad debt in the financial sector as well. It’s one thing to invest in a company with good earning potential – giving them the capital to invest in a new factory and expand production. It’s another to take leveraged bets on opaque financial instruments (like sub-prime mortgage back securities), or speculate in hot markets. There is good debt, and bad debt. And sadly, on the face of it, you’d have to think that the global balance is tipping further and further towards bad debt. McKinsey and co. have estimated that global debt has risen by $57 trillion since the GFC – to just under $200 trillion today. If debt was the scoundrel that unleashed the GFC on the world, should we be worried that debt is going up, not down. The answer to that is really whether it’s been good debt or bad debt. It’s hard to know exactly, but on the face of it, it doesn’t look good. Debt has risen over 40% since the GFC. Global output growth though has risen, what, 20% tops? So debt is growing twice as fast as production. To me that seems to suggest that there’s a lot of speculation going on here. Either people think that some real boom times are coming in the near future (which I doubt), or everyone’s just getting back on the credit sauce. And it is a global phenomenon. All major economies today have higher levels of borrowing relative to GDP than they did in 2007. Global debt to GDP has risen by 17 percentage points. Worryingly, almost half of it is government debt, which has grown by $25 trillion since 2007. In 10 of the countries they studied, it exceeded 100% of GDP. But household debt is also “reaching new peaks”. Only Ireland, Spain, the UK and the US have deleveraged at the household level. In advanced economies such Australia, Canada and Denmark, it now exceeds pre-GFC levels. But you’d have to think this is one of the natural consequences of the QE era. When credit is cheap – or effectively free for some participants in some markets – then you would expect people to take on more credit. The cost of serving that credit has obviously fallen. But the flip-side of that is that when credit is super-cheap, there’s less incentive to use it wisely. Just throw it any market showing signs of growth. Invent some new-fangled financial instrument to throw the dice on. New footy fields for everyone! The tower of debt keeps growing. With each new layer the dangers grow and we have further to fall. More than ever we need prudent lending practices and tight credit criteria, and mechanisms to ensure that money flows into productive activity. If that sounds like a lot to ask for, it’s because it is. I’m going to call it. The QLD election marks the death of democracy as we know it. And I for one will be dancing all over its grave. The Queensland election was a shock. No one saw it coming. No one even thought such a massive swing was possible. But swing it did. And an unpopular premier is left swinging from a tree. And arrogant politicians and pundits on all sides, guys like George Brandis, are left bemoaning the ‘unprecedented volatility’ that’s taken hold of the electorate. Like there’s been some inexplicable surge of volatility, like some freak of nature, leaving hung parliaments and one-term governments in its wake. And as if somehow the electorate is the problem here. The way I see it, the electorate is waking up and is not willing to be treated like idiots anymore. It’s great. But this, if you’re part of the governing class, is a problem. A massive problem. And what Brandis and co. are really bemoaning is the loss of the first term window – a window where you got to push through whatever partisan and ideological rubbish you wanted to (and that nobody ever voted for), safe in the knowledge that a forgiving electorate would give you another chance. Sticks in the first half, carrots in the second. But now that that window’s gone, how are they going to be able to do the stuff that no one wants and no one voted for? And what these governments seem to keep (conveniently?) forgetting is that a vote ‘against’ is not a vote ‘for’. Campbell Newman got in because Queensland was tired of Labor’s shenanigans. In the same way that this week’s result is about punishing the LNP, not about endorsing a bunch of Labor nobodies that no one has ever heard of. But Newman took it as a license to do what he (and his financial backers) wanted. And that’s the trust that was broken. We voted for you to get rid of the other guys, not so you could just come in and do what you want. Same story with Abbott. We were willing to overlook the fact that he was a monarchist nut-job, so long as he could wipe the smirk off Rudd’s face for us. So when he turns around and gives the Queen’s cuddle buddy the highest possible honour in Australia, we feel ripped off – betrayed. Hey! You didn’t have a mandate for that! And this is the crux. We feel like our politicians aren’t representing us. They’re pushing their own ideological, partisan, corporate or union factional agendas – right over the top of their constituent’s interests. We feel unrepresented, and this make us justifiably angry. And then we take that anger to the ballot box and do the only thing we can. Vote against the people who’ve betrayed us. Leaving a growing string of one-term governments in our wake. But then we only end up voting in another bunch of useless clowns whose sole promise has been to be ‘not like the other mob’. But we soon find that they’re exactly like the other mob, and so back to the ballot box we go. But Australia is getting tired of this. And so this is not about Abbott or Newman or Rudd or whatever that new blokes name is. This is about the great lie at the heart of our democracy. 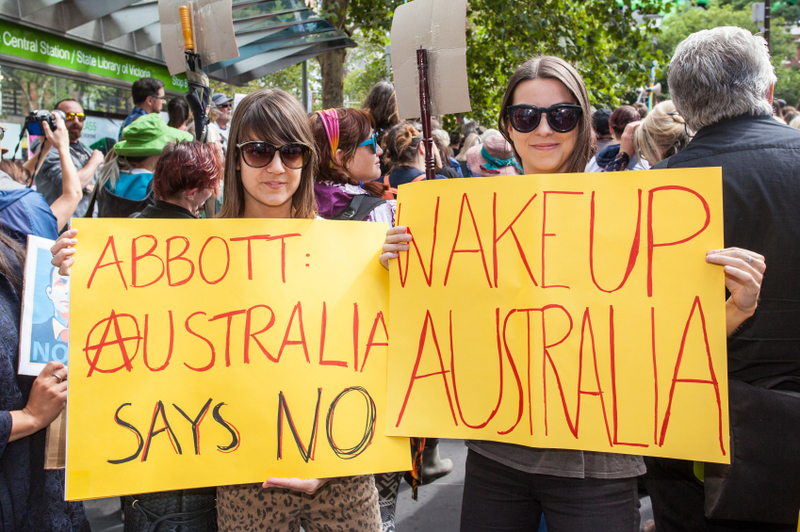 Our representative democracy isn’t very representative, and the Australian people are slowly waking up to it. This first point is about local members. There’s about 100,000 voters in each Federal electorate. How can one person possibly represent the views and interests of 100,000 people? It’s absurd. My local member doesn’t even know my name. But the idea is that he or she goes in and represents my interests in federal parliament – in the house of representatives. But even if they could some how take stock of the diverse range of views held in a single electorate, what freedom would they have to act on it? They’re totally bound by party lines. Now I don’t have any influence over party policy, so if my “representative” is just a puppet for party policy, how much representation do I have then? What’s more, I only get to let my unrepresentative know what I think every two or three years. And at that time, I’m voting on a whole suite of policies. So what happens if I passionately agree with the government’s direction of tourism marketing, but passionately disagree with their allocation of sports funding? What do I do then? I’ve only got one vote. The idea that we live in a democracy is a joke. We are all completely disenfranchised. But it seems to me that we’re waking up to it. We realise that our governments don’t represent us, and our anger is creating increasingly volatile electorates. And I wonder if this is all because we are getting a taste of what true democracy is like. If I can vote on the fortunes of some Justin Beiber wannabe on X-factor, why can’t I get that kind of say of government policy? Not just who happens to be leader, but all government policy. We’re approaching a tipping point. The people want to be heard and to be truly represented. The establishment is not willing to give up their right to govern (rule?) and do what they want. This is the stuff that revolutions are made of. Are you ready for an interest rate surprise? I’ve been saying for a while that I expect one or two rate cuts this year, but there’s every chance we could see one this afternoon. Really? It’s be a bit of a radical move, but Glenn’s not afraid of getting radical. And he’s got all the justification he needs. First up, there’s inflation. 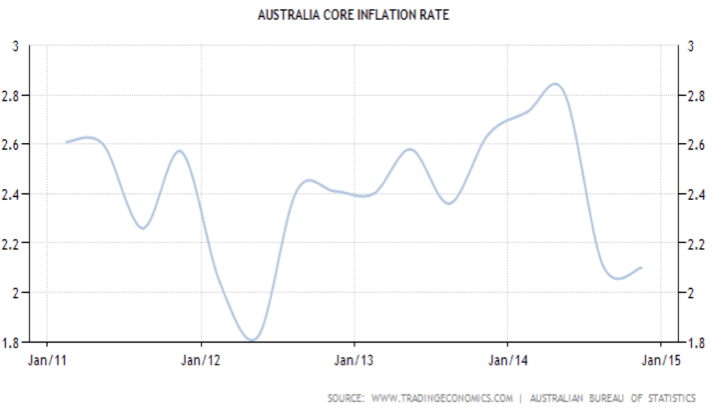 Inflation is trending lower, and on the core measure (taking out volatile items), it’s just a fraction above the lower bound of the RBA’s target band of 2-3%. They’ve got a country mile of head room. 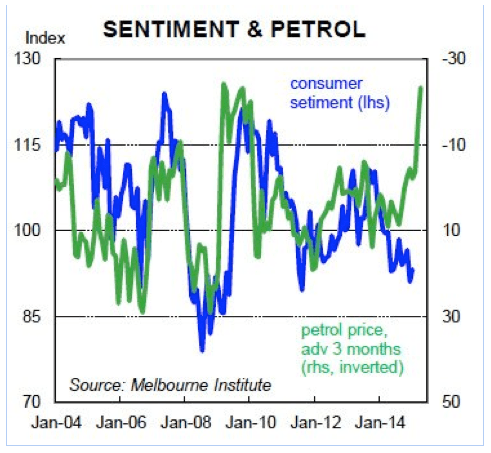 But this measure excludes petrol prices, which have dropped recently and driven inflation a lot lower. That won’t show up in the core measure straight away, but petrol is one of the fundamental building blocks of the economy. Lower prices, mean sooner or later, the price of most things will start to fall. So that’s the inflation situation. We’ve only just got our head above the lower-bound, but there’s a heap of downward momentum coming our way. There’s enough of a story in this one chart alone to justify a rate cut tomorrow if they want to. But what about the economy? How are we doing? Normally you only see rate cuts when the economy’s not going so great. In my view though, the economy is holding up ok – well, even. To start with petrol prices have given every thing a whip along. This has a big impact on the entire economy, because suddenly the cost of shipping stuff all over the place just got a whole lot cheaper. The physical side (less so for the services sector – real estate, finance etc….) of the economy just got a big shot in the arm. But it has a huge and direct impact on consumers. 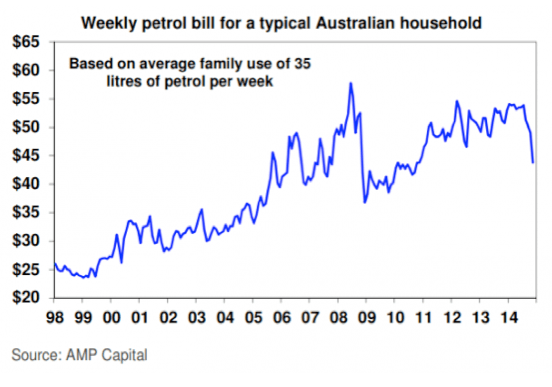 The average weekly petrol bill has fallen to levels not seen since the aftermath of the GFC. Household budgets just got a lot more wiggle room. We should see a bounce in consumer spending before too long. There’s a pretty tight relationship, and that makes sense because petrol makes up a considerable part of household budgets. So we should see a boost in retail spending soon enough. 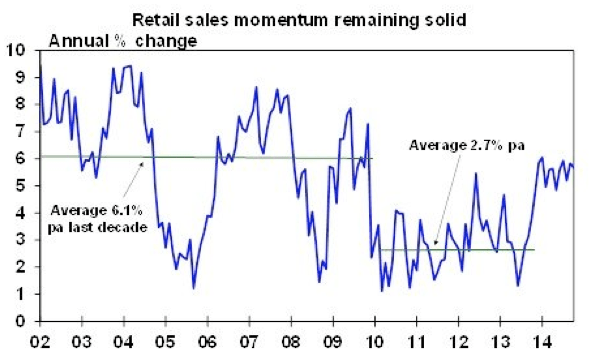 But retail spending is already holding up well. Towards the end of last year retail sales growth bounced up above averages of the past four years – where they were growing at just 2.7% a year, to around 6% pa. This is the kind of growth we saw in the boom years of the 2000s. At the same time, record-low interest rates have reduced household debt servicing burdens. 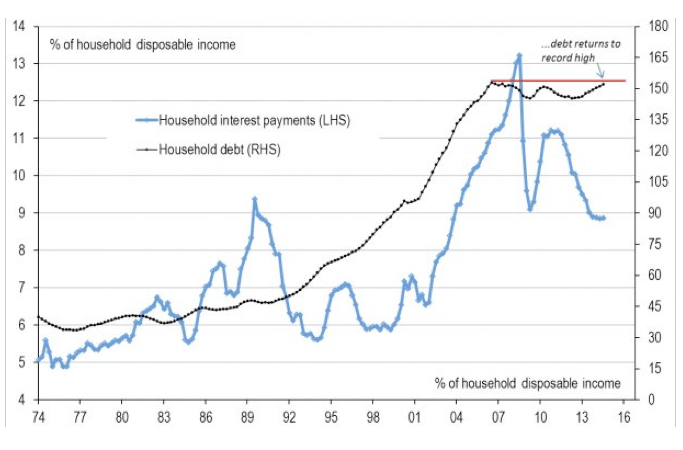 Household debt as a percent of disposable income remains at record highs, but all that matters is whether households can afford those levels of debt. And one of the big reasons why they’ve been able to afford them up until now is because of falling interest rates. Interest payments as a percent of disposable income have already been falling. Further rate cuts will drive them even lower. This creates even more room in household budgets, and should also help give consumer spending a boost. At the same time, the production side of the economy is also doing pretty well – in part helped along by a lower Australian dollar. The transition away from the mining boom has been one of the dominant themes over the past year or so. Would it be a gentle transition, or collapse and carnage? Well now it seems that the gentle transition scenario is looking most likely. 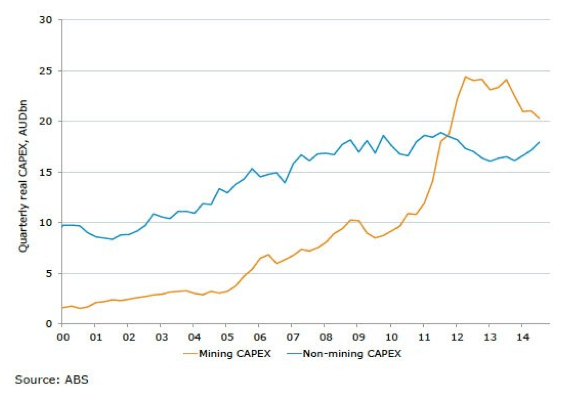 This chart here shows capex (capital expenditure = investment) in the mining and the non-mining sectors. The downturn in mining investment is evident, but there is a clear upswing in the non-mining sector coming into play as well. And if we get more action on the consumer front, that should encourage even more investment. It’s definitely not crash and carnage. At the same time, our key export markets are going great guns. The US recovery is more solid every day, and China is also keeping it together. A lot has been made of falling growth rates in China, but it’s mostly a statistical artefact. Big percentage growth rates are easier off a lower base. 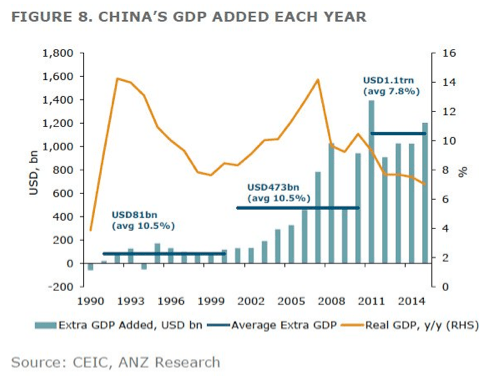 Even though growth rates are slowing, they’re still adding over a trillion USD to the economy every year. That’s still big demand, and big demand for Australian commodities and exports. So this is the picture that the RBA will be looking at. Inflation is stalling, but the economy is holding up well. So what’s going to be the deciding factor? The exchange rate. It comes back to that. The RBA will be very happy with the recent falls against the USD, but you just can’t keep a good currency down – especially when other countries are tyring to drive their currencies down as well. And Europe and Japan are throwing trillions at driving their currencies lower. And if you look at what’s happened with the Aussie dollar, there’s been some good falls against the USD, but less so against many of the other major currencies. It’s even appreciated against the Canadian dollar and British Pound over the past month or so. The RBA knows that in this environment, when everyone’s leaning hard on their currencies, you can’t just sit on the sidelines. You need to get in the game. If they don’t move, and move soon, all the good work that’s happened could be undone. There’s a quiet revolution going on in toilet technology. It really is an age where anything is possible. Australian toilets use up to 12 litres in a single flush. There’s been a few improvements in water-efficiency in recent years but the fact remains – in one of the driest continents on earth, we still flush swimming pools of perfectly good drinking water down our toilets. And some years, I can only water my garden on a Wednesday. Toilets are old school. In fact, look around your house. Chances are your toilet is the most antiquated piece of technology you own. Is there anything older? Do you own a wind-up gramophone? They took a while to get going in the West, but archaeologists have dug up a working toilet in China that’s 2400 years old. And it looks pretty much the same as ours. There’s a stone bowl and running water – even an arm-rest. But the fundamental essence of ‘toilet’ is the same, and it hasn’t changed in thousands of years: there’s a bowl, that fills with water, and pipes that take it away to the sewerage pipes, which take it even further away. This is the essence of toilet. And maybe this is a case of ‘if it ain’t broke don’t fix it’. But if water is going to remain one of the big challenges in Australia, then surely there’s scope to get a little creative. And I was reading about the Bill and Melinda Gates foundation the other day. They’re getting behind all sorts of fantastic causes. Ending hunger, eradicating disease, building super toilets. Hey? Yep, turns out one of their missions is to build the toilets of the future. They’ve given 8 universities funding to help bring toilets into the 21st century. They’re dreaming of toilets that require no infrastructure – no pipes under the floor, no leach field under the lawn, no sewer systems under the street. The super toilets just powder and burn the faeces and flash-evaporate the urine, making everything sterile in the process. And it’s a toilet that keeps on giving – packets of urea (for fertiliser), table salt (there’s a marketing challenge! ), even enough power to charge your mobile phone. And these toilets even create fresh-water for you. If they succeed, the implications are staggering. Poor sanitation is still one of the primary causes of death and disease in the developing world. Super-toilets could save millions of lives. But even in the developed world, they reckon three quarters of our water bills comes from hauling away waste and running sewerage treatment plants. It saves money. It saves water. There’s free salt. It’s win win win. They’re also aiming for the super toilets to be able to process green-waste – food scraps and garden clippings etc. All the while being totally self-contained and self-powered. Apparently there’s over a megajoule per day of energy in human faeces – enough to power the toilet, and your mobile phone – even the lights! And how far away is this technology. 10 years, 20 years? Well, no. Apparently you can build one today with off-the-shelf parts. The technology is already here. The only challenge left is to achieve economies of scale. The Gates foundation has set a target of 5c a day – because that’s what they reckon the developing world can afford. 5c a day. Or just $18.25 a year. For a techno-toilet that would probably mean the end of water restrictions in Australia. I’m going to get out the slip-n-slide and party like it’s 1972. This is what excites me these days. We get so focused on what one nut-job did in Lindt café, or what one politician said about this or that, that we lose sight of what powerful stuff is going on quietly behind the scenes. There are people with vision, teaming up with people with resources (thanks Bill! ), teaming up with people with amazing technology, and trying to tackle the great challenges of our time – challenges that have plagued humanity for thousands of years. And now, suddenly, it looks like victory could be ours. And the toilet is just one example. This wild technological age is enabling quiet, peaceful but incredibly powerful revolutions all over the place. And I love this toilet example because it’s so mundane. We’re not talking about flying into space or harnessing free energy from the earth’s rotation. This is just about using technology and creative intelligence to build a better toilet. But we have the technological and organisational means now to be able to leverage a single simple innovation into a global revolution. Develop the prototype in California, email the plans to production centres around the world, and within a year or two you could have the whole world turned on to a brand new way of doing things. And millions and millions of lives could be saved. And this is just with a better toilet. What other revolutions are hidden in your back-yard? This is an age for questioning what we know. Questioning the status quo – the way we’ve always done things. Because really, now, anything is possible. Every individual has a network of creative and technical genius at their finger-tips. Technology has gone ballistic. The lags between conception and realisation get shorter every day. The world has no shortage of challenges. But for every challenge, there is an abundance of answers. Is property headed for 1.5% p.a? One survey shows that ‘experts’ are predicting price growth of just 1.5%. What do they know that we don’t? Or are they just nuts? An interesting headline caught my eye the other day: “Property experts see growth of just 1.5% pa.” I saw the same data reported with the headline “Price Hopes Fading”. What? Who are these experts and where did they come up with this outlandish figure. Turns out it comes from the NAB survey of property professionals. This is the chart here, which tracks their expectations of future price growth. The thing to note here is property expert expectations are remarkably stable. Over the last couple of years they’ve stayed within a band of +/-2%. Now hang on a second. Property prices grew close to 10% last year. So are we saying that property experts ‘missed’ this figure by over 8%? That’s a big miss. If my experts were getting it that wrong, I’d be finding some new experts. So it seems fishy to me. Sounds like there’s something in the way they’re asking the question, or in the way they’re collating the data together. So maybe the numbers are no good, but perhaps we can get a useful read on the market from the ‘change’ in their expectations. And that’s probably what the ‘price expectations fade’ headline was about. Price expectations were down a fraction in Q4 2014. Well, so what? That’s not unreasonable. 2014 was a big year, full of hype and promise – the first big cycle after the GFC. And so people are expecting things to be a touch more settled this year. I don’t think that’s unreasonable. But look at expectations going out to 2016. In 2016, they’re expecting price increases to be back at record levels (a massive 2%!). Leaving the level aside, it’s the strongest expectations in several years. The last time they were that strong, we were posting double digit growth (in the real world). So to me it seems like a very long bow to draw to say that these results means that price hopes are fading, or the market is softening, or whatever headline they want to come up with. The other thing to note is that the national results are being pretty much being dragged down by two markets – WA and SA/NT. I don’t know how much sense it makes to lump SA and NT together. The NT is such a small market, and at the maturing end of a boom. SA is much larger, and at the end of a consolidation phase. It’s comparing little apples with big oranges. And property experts in WA are doing it tough right now, it seems. They’ve totally got the glums. But then they’re hopeful about the future. In two years time they see WA falling back in line with the rest of the country, and doing pretty well. So the future’s looking up. There were a few other titbits in the survey results that are worth a look. The first is about foreign purchases of property. 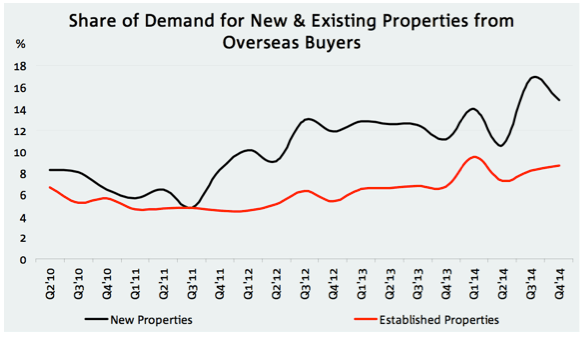 This chart here shows there’s been a strong upward trend in foreign purchasing of both new and existing property, kicking off around Q3 2011. The new property share is down a touch to 15%, but still on a huge upswing. The existing property share is up to almost 9%, continuing a steady upward trend. NAB says that in Victoria, 1 in 3 buyers of new property are from overseas – a figure that in my guess has been driven by inner-city apartment sales. 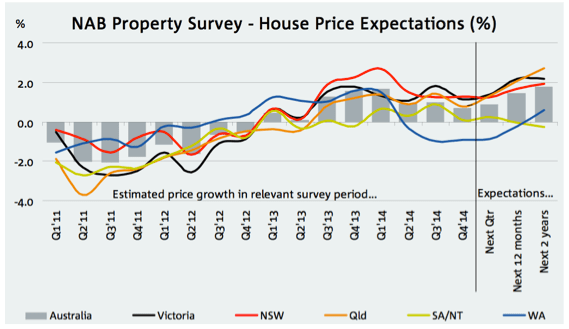 Look at this chart here – Victoria’s going through the roof! All this squares with the anecdotal evidence we’re hearing about foreign buyers having a major impact on the market. On these figures, 1 in 7 buyers of new properties are from overseas. For existing properties, it’s 1 in 11. That’s significant. And it seems to me there’s still plenty of room to grow here – particularly with global markets going where they’re going. There is something a little odd with the existing home sales data though. If you do the maths, 9% equates to around 40,000 homes last year. But last year, the FIRB reported that it received applications for and approved sales of 5017 existing dwellings to foreign nationals. Are we saying 35,000 foreign nationals went under the radar? Are we saying that only 12% of foreign buyers who bought existing property went through the proper channels? And the FIRB has had zero prosecutions in seven years? These are the hard questions that need to be asked. We saw some good work from O’Dwyer’s review last year. They got the right end of the stick. Let’s hope that insight translates into action. The other titbit that’s interesting is the read on first-home buyers. According to NAB, for both new and existing developments, first home buyers make up a quarter of the market – that’s a figure in line with historical averages and shows no evidence of FHBS being squeezed out of the market. 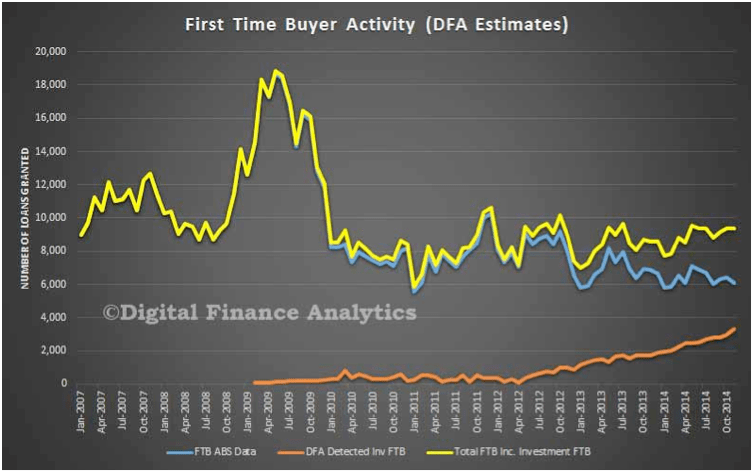 This is the new FHB investor class I’ve been talking about, and squares with the figures I revealed last week – figures that showed that 1 in 3 FHBs were skipping the primary place of residence and going straight to an investment property. That’s a figure that’s on the rise. It will be very interesting to see where it levels out. … if you take it with the right grain of salt. NO B.S. FRIDAY: Do you know what you want to be? An over-emphasis on job titles and fame keeps us from living the rich and enjoyable lives we’re meant to live. Is there a way out? It’s fluffy and it feels nice, but it’s not really true, is it? Say I really want to be a prima ballerina. Even if I found my current passion for lycra and tutus earlier in life, it’s a destiny that was probably never in my cards. I just don’t have the genetics for it. Ballerina’s need a rare combination of a lithe physique and powerful muscles. These dwarf-warrior legs of mine might have power, but no one’s going to pay to see me in tights. Same story if I wanted to be an opera singer. Owls come hunting for frogs when I sing in the shower. Vocal range wasn’t a gift I was born with. And so ‘you can be what you want’ just isn’t true. And a generation of kids who’ve grown up on this sweet smap just don’t know what to do with themselves. I think at the heart of this sentiment though is a core I can believe in. And that’s the idea that you should never let anyone limit you or tell you what you can’t do. Take a look at your own gifts and talents, and decide for yourself if you’re smart, fast, handsome… whatever. And then choose your own life path accordingly. But the other place this falls off the rails I reckon is the emphasis on ‘be’. I don’t think actual job titles have that much to do with life satisfaction. Is your average plumber happier than your average accountant? Does a famous sportsperson live a more satisfying life than a small-business owner? Who knows? It’s completely up to the individual and their particular job. We know what kind of things make jobs more enjoyable – things like autonomy, a sense of meaning, challenge, drawing on your creative talents… etc. You could find jobs with these qualities at NASA and the ATO. So why do we get so hung up on job titles? We ask our children what they want to ‘be’ when they grow up. We push them to pick something from the small number of generic jobs they understand (fire-fighter, baker…), and we want them to start identifying with it. A better way to go is to ask what ‘qualities’ they wan to develop as they get older. Do they want to be brave, caring, adventurous, happy, driven…? These are exactly the questions we want to be asking our selves too. It’s not about what we “do”. Is about “how” we live. Do we have autonomy in our lives? Do we have a sense of purpose? Do we feel challenged? Do we get to express ourselves creatively? These are the things that matter – that make us happy. Focus on these qualities, and let the ‘do’ fall into place. In a way, kids are already switched on to it. Ask them what they want to be, and these days they say “famous”. We live in an age that idolises fame. Even though we’ve seen the train wreck that the lives of Britney Spears and McCauley Culkin have become, we’re still drawn to fame. Seriously, can you imagine anything worse? Photographers popping up everywhere you go. It looks like hell on earth, but now it’s the number one thing our kids aspire to. You could argue that they don’t really understand what it’s like and what fame involves, and I think that’s right. So what is so appealing about fame? Well I think fame is really a cluster of qualities – qualities that you can connect back to some pretty fundamental human needs. Obviously there’s elevated social status – which ties back to security and safety. Then there’s recognition – which comes back to connection, acceptance and a sense of self-worth. And then there’s probably the lifestyle appeal – flashy shiny things, fast cars and aeroplanes –the ability to live in some kind of materialist paradise. Now there’s nothing wrong with wanting any of these things- they’re pretty basic needs. But I think we can agree that ‘fame’ is probably to worst possible route to achieving them. And so again, I reckon bring the kids back to the way they want to live, and the kind of beings they want to be. Teach them to value connection and show them that the way to build it is by putting energy into the personal relationships. Teach them to take pride in what they do, and that success is measured by how hard they worked, not whether random people thought it was any good or not. And let them enjoy their sensual pleasures. Teach them that the life is for enjoying, and in an abundant world you can have the lifestyle and all the things you want to enjoy. Sign them up to my blog. Teach them to get in touch with what they truly desire. If they can get clarity on this, then they will find freedom in the world. So what are you going to teach yourself and how is that going to make this the best year of your life? This is a bit of a scoop. Quite frankly, I don’t know how the main press and media have missed this… Maybe they did it on purpose. Maybe they’re just dumb and stupid. …What you’ve been hearing about the struggles of the first home-buyer is B.S. There is a whole new class of property investors that will shock you when I reveal the research, stats and data. Now I know you’re not going to believe this, but the media got it wrong! This was the narrative doing the rounds and a lot of people bought into it. Prices had gotten so out of hand that first home buyers simply couldn’t afford to get into the market. They just couldn’t compete with investors (greedy, evil bastards), or was it the Chinese? As a result, first home buyers went on strike, and the share of FHBs in the market tanked. Tracking the yellow line, by the end of last year, first home buyers made up just a little over 10% of the market – the lowest level on record. But to people like me, this just didn’t quite add up. Why would FHBs keep themselves out of a market like this? It was clear that with the end of first home buyer grants around the country, there had been a ‘pull forward’ of demand ahead of the cut-off dates. So some drop off after the deadlines was to be expected. But FHBs never came back. The share just kept going lower and lower. Sure property prices were high, and clearly moving higher, but the truth was that most affordability measures were fine, if not improving. And that’s because interest rates have such a major impact on weekly mortgage repayments and therefore ‘ability to pay’. And interest rates were at historic lows, and only going lower. So the ‘they can’t afford it’ line just didn’t make sense. So were they simply choosing to stay out of the market? But that doesn’t make sense, unless you thought that a major price correction was imminent. I’ll admit there was a lot of talk of that in the media for a while after the GFC, but by the middle of last year, that idea had been shown to be the empty shell it was. The property market had clearly started another bull run. And in a bull run, what do you gain by waiting? Nothing. You only run the risk of missing out on getting in on the ground floor. My advice to FHBs at the beginning of last year, especially in Sydney, would have been do whatever you can to get in on the property ladder now. You’ll be kicking yourself if you wait. Now I’m not particularly smart. I think most potential FHBs would have seen the writing on the wall. So f you thought even a little about it, it didn’t make a whole lot of sense, but the media didn’t even give it that much thought. Young families locked out of the great Australian dream was just too tasty a story to pass up. But then comes the revelation at the end of last year that the ABS didn’t trust their own data. Turns out they were letting the banks self-report the mortgage data, and if it didn’t have a first home owners grant attached to it, then there was a good chance that mortgage fell through the cracks. The ABS had been under-reporting FHBs. Well, that made a lot of sense, but how much? Nobody knew. Thankfully Martin North and Digital Finance Analytics has been doing some excellent survey work – actually going out there and finding out what FHBs are up to. There were about 10,000 FHB mortgage applications at the end of last year – a number pretty much in line with post-GFC averages. It should also bump FHBS back up around 15-20% of the market – again, that’s fairly normal. But the really interesting part of this story, and the thing that is different this time around is that FHBs have got a taste for investing. FHBs are jumping the usual primary place of residence stepping stone and going straight to investorship. 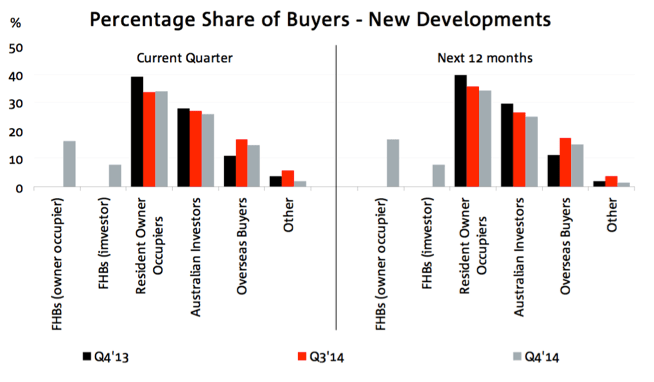 Before the GFC, practically no first home buyers bought investment properties. 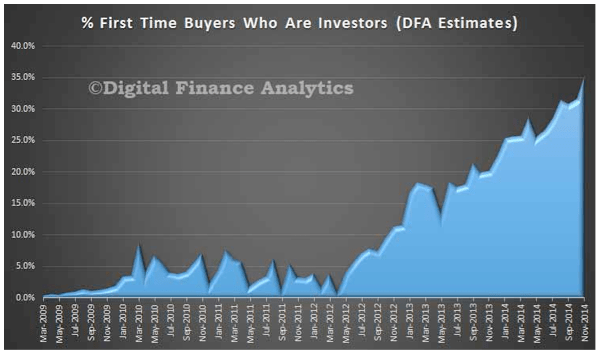 Now, a massive 35% of FHBs are buying investment properties. This changes everything. This flips the traditional property model on its head – the one where you buy your first home, save and save and save, buy a nicer home in a better suburb, save and save and save, and then maybe buy a investment property to give you a bit of cash flow in retirement. Now more and more FHBs are using property investment to get a foothold in the market. They buy somewhere they can afford, but don’t necessarily want to live. They then use the cash flow and capital gains to build a deposit for their real first home – often staying at home to really accelerate their savings plan. Oh, and according to DFA, one third of those investors are leveraging their connections with Bank of Mum and Dad to get into the market. And so now, we have a totally different picture of the market. It is not that poor old FHBs are priced out of the market, pathetic wall-flowers on the sidelines of the dance. Rather, FHBs are switched on and savvy. They know they need to build wealth to buy the house they want to live in, and they know that property investing, in today’s market, is one of the best ways to do it. They’ve seen the wealth potential in property, and are going for it. Good on ‘em. Don’t worry about the kids. They’re ok. The question I have for you is, if struggling first home-buyers have seen the property investment light, what are your plans for 2015? Are you a buyer or a seller? 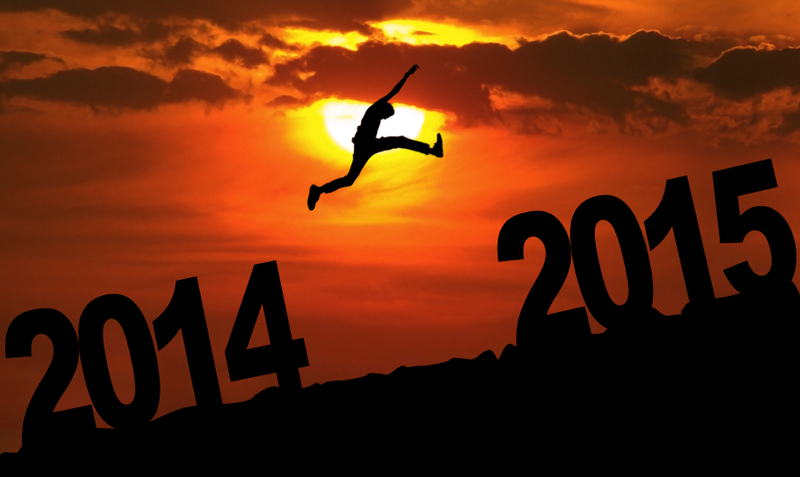 What's going to happen in 2015? It's hot today, very, very hot. I'm sitting at the cafe, Bistro C on the Beach in Noosa… Chilling and thinking. Thinking about 2015… But firstly, lets take a step back and look how last year panned out. The dominant themes of 2014 will carry through into the new year, but here’s a few leftfield factors to watch out for in 2015. The cyclical recovery already underway will strengthen. and all in the context of a brighter economic outlook. This is, pretty much, exactly how it played out. House price growth accelerated through the year, coming it at around 8% annually, though Sydney and Melbourne did considerably better. This cyclical momentum was supported by important structural factors. Chinese buying appeared to have a major impact on the market (though no one knows exactly how much). SMSFs also positioned themselves to become major players in the market, but my feeling is we only saw the thin end of the wedge of that in 2014. SMSFs could go on to be one of the key influences in 2015. And this was taking place in an economic context that failed to inspire much confidence, but actually did better than pretty much everyone expected. From where we stood at the beginning of 2014, we could have done a lot worse. And so property became one of the key success stories of 2014 – the bright spot in an otherwise lacklustre year. And over a longer run..? Well, property is still miles ahead of the pack. 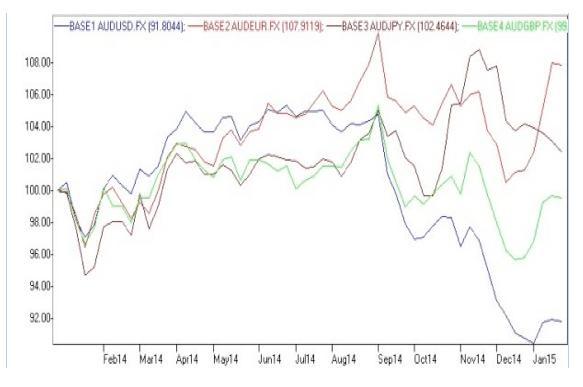 The latest RP Data / Corelogic Pain and Gain report shows the power of a buy and hold strategy. Over 90% of homes sold in the September quarter last year were sold at a profit – the average (AVERAGE!) gross profit was $223,870. In fact 30% of home sales saw owners double their money. In the September quarter, Australians booked almost $14 billion of gross profits! This is all very impressive, but none of these trends should be surprising. The longer you hold a property, the bigger the profits at the time of sale. Property losses are almost entirely focused in the short term, particularly driven by regional markets in WA and Queensland – which became overblown with the mining boom. But in the capitals, everyone is doing well. 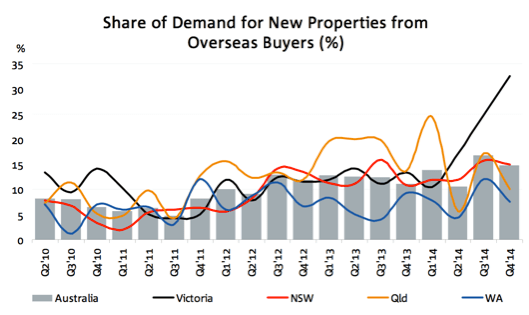 In Sydney, only 2.6% of homes sold in the September quarter sold at a loss. As I keep saying, there’s an art to property investing. You can’t just throw money at the market and (always) expect to make money. You’ve got to do your research, find your property and time your run. And in any bull run, some segments will get over-cooked. I flagged a few last year. There’ll be more to watch out for this year as well. And so what are the key trends to watch out for in 2015? Well, there’s the usual suspects. Interest rates remain at exceptional lows, Chinese appetites are unsated, and SMSFs still have plenty in the tank as well. All of these remain a strong lift under property. But there’s a few trends, just dots on the horizon at this stage, that might come out of left-field and make themselves felt. The first is Japanese buyers. Yep. The Japanese. 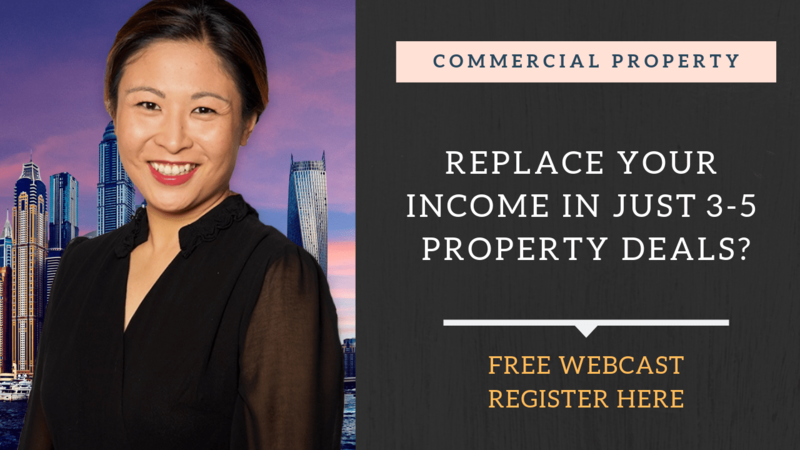 There are reports that Japan’s major real estate companies are on the hunt for Australian property assets at the moment. I thought the Japanese economy was in the toilet? Well, it is. But Japan has the money printing machine on full bore to try and dig themselves out of their hole, and that money has to go somewhere. As we’ve seen, Aussie property remains an attractive option on the global scene, and the longer Japan leaves the printing press on, the more likely we are to see them make themselves felt in the market. This could be interesting. Because there are reports that the Japanese have learnt the lessons of the 80s, and won’t be drawn in to luxury, trophy markets. They’ll be middle of the road players this time around. Another segment to watch will be first home buyers. We’ve heard a lot about the absence of FHBs. 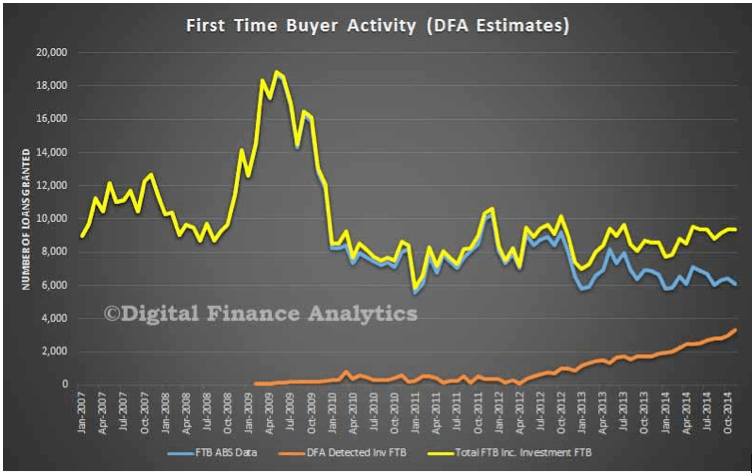 The number of FHB finance approvals is at record lows. But it seems that a lot of that is due to the fact that banks just aren’t reporting the data properly. Now that First Home Owner grants have wound up in most states, there’s less need to actually report whether a loan is for a newbie or not. And part of the reason that FHBs are flying under the radar, is that a growing share of them are jumping the principal place of residence and going straight to investment properties. In a market like this, that strategy makes a lot of sense. But this is still a relatively new trend. It will be interesting to watch this year where FHB activity establishes itself. But perhaps the biggest influence on the Aussie property market will be the global outlook, which remains messy and confusing. The World Bank has cut it’s forecast for growth this year from 3.7% to 3.0%, thanks to the floppy nature of Europe. That’s a significant downgrade. At the same time though, oil prices have fallen nearly 50%, with further to run. Lower petrol prices are a big shot in the arm, and are probably the equivalent of several rate cuts – across the world! But a 50% reduction in oil prices is a massive structural shift in the global economy. The consequences will be very difficult to predict. Together, these factors could make for a very interesting year. Overall, the outlook for property is still bullish, and I expect we’ll end the year running at around the same pace as we started. I think we’ll see a rate cut or two in the mix, which will be more fuel to the fire. Well, you’ll just have to stay tuned. Say NO to resolutions… Use this instead! Here’s my strategy for clearing the mind, tapping the creative potential of your brain, and starting the year with a spring in your step. I need a holiday from my holiday. Sound familiar? I’ve heard it more than once this silly season. We spend the run up to Christmas hustling to get everything done, dreaming of all the free-time we’ll have once the holidays arrive. But then they do come. And then there’s Christmas to organise, lunch to prepare, presents to wrap. There’s plans for New Year’s Eve, catch-ups with Dan and Sally, dropping in to your mother in-law’s. And then there’s all the odd-jobs around the house you thought you’d get time for. Cleaning the curtains, fixing up the fence, trimming back the hibiscus. And what about a digital catch up? The witty blogs you didn’t get around to reading, that hilarious youtube video everyone’s talking about. Emails to long lost friends that have been on your to-do list for years. Christmas is a manic time of year. In some ways we shouldn’t be surprised. It’s high summer. In the human and animal kingdoms it’s a time of peak activity. It’s a time for getting stuff done. Hoard some nuts, paint the fence. And I think for a lot of us, the Christmas holidays become the over-flow of life. Don’t have time for it now? Stick it in Christmas’s inbox. But all that means that we end up running ourselves ragged trying to get everything done. Combine that with feasting and booze, and a lot of us end up starting the year wiped out. We hit the ground flat-footed. That’s why, for some time now, I’ve been trying to make a point of getting some genuine R’n’R in the first weeks of the year. Right now, I’m still up in Noosa, writing this from a beach-side café. I’m only just starting to get my mind back into the practical realities of my work. Because I think rest and relaxation is one of the most under-rated ingredients of a successful life. You can’t keep flogging the horse or the monkey without a break. Sooner or later it’s going to fall over or off. And a rested, relaxed outlook is the engine of creative thought. A few years ago I noticed a bit of a pattern. Whenever I took a real break, my mind seemed to go through three phases. The first seemed to be about processing. 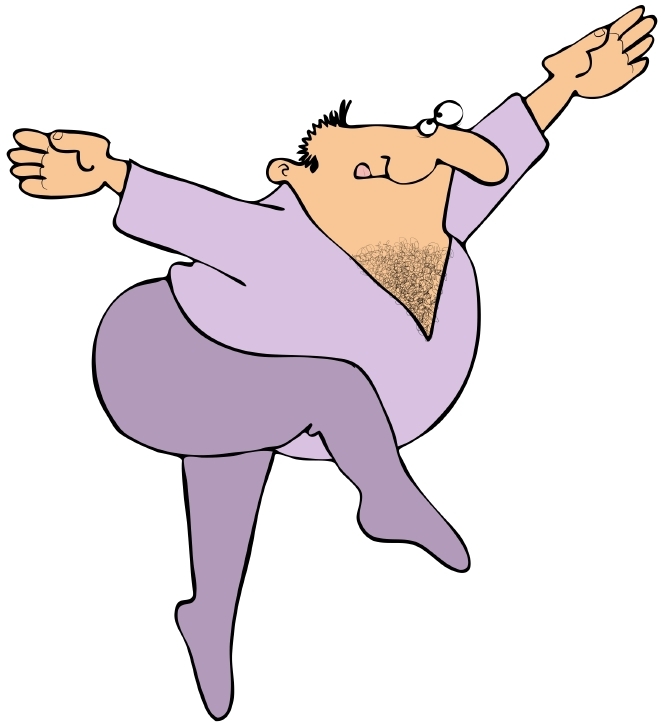 Seems to me that mind is a bit like the stomach – it’s a digestive organ. But rather than food, it’s digesting information and stimulus. And we live in an incredibly stimulating age. We are carpet-bombarded with news and stories and pretty things. We get so habituated (addicted?) to it that we actually start craving and seeking out distraction. But the mind is designed to process everything. And if it doesn’t get a chance in our busy lives, I kinda feel it files stuff away in the ‘come back to it later’ compartment of our brains. But our busy lives never give us a chance to come back to it. And so we end up mentally blocked up, in good need of a psychic enema. And so it’s only when you cut the stimulus back to a minimum that the brain starts getting its affairs in order. It starts clearing through the old files on your desk, putting things away and making everything neat and tidy. This is the first phase. And I found for me that I’d just start rambling to my wife about what I should have done with that project, why this project failed, why this one was a success. It wasn’t planned. It just spontaneously flowed out of me, as my brain processed a busy year. For me, it was deeply relaxing. For my wife, it was a signal that it was time to go shopping. In the next phase, nothing much happens at all. I’m not driven to think about past projects, I’m not inspired to think about future projects. I barely think at all. Days pass, and I let tumbleweeds just blow about between my ears. I don’t know what happens in this phase. Maybe the brain is repairing itself. Maybe it’s just taking a break. Who knows? But it seems a necessary part of the cycle. The cold winter of thought. After that, in the third phase, I find myself drawn back to my projects. My mind naturally starts ticking over the possibilities, finding things to get excited about. And I find I can see them in a new light. Connections that were once hidden are now obvious. The road forward is a lot easier to make out. My thinking is fresher and a lot more ‘outside the box’. But you can’t rush it. You need to give it time and space. And the handful of days between Christmas and New Year, when there’s 100 other things on, is exactly NOT that time and space. And all this is not to be confused with the pie-in-the-sky daydreaming that we call New Year’s resolutions. “I’m going to have six pack abs and a million dollars” is not a goal. It’s just a daydream. And calling it a ‘new years resolution’, doesn’t make it any less of a fantasy. And the truth is, if you’re drawn in to this kind of wishful thinking, you’ll probably never be successful. So, that’s the question… did you get the break the rest you needed? Did you get to access an empowered, creative mindset, full of inspired strategies and fresh angles? Or just more wishful thinking, jammed between catch-ups and mince pies? Another week, and 7 more days I’m grateful to be Jon Giaan, living Jon Giaan’s life. I’m grateful I wasn’t bailed up in that Lindt café in Sydney, dwelling on the horrible reality that I might not see my loved ones again. But I’m grateful too that I’m not affected any of the violence that rears it’s ugly head in 1000s of trouble-spots across the world. Today, I’m feeling for those parents who lost their kids in the school massacre in Afghanistan. And I’m also grateful that I’m not some journalist being paid to whip tragedy into sensation, for papers crying crocodile tears over genuine loss – whatever sells. I’m grateful that I actually have the space and freedom to write what I want – to throw my truth into the mix of contested truths. And I’m grateful that I can make a sport out of sinking the boot into our politicians and vested interests, without worrying about unmarked cars parked in front of my house, or heavy breaths on the phone at 1am. I’m grateful that I live and do business in an economy that continues to be the envy of the world. Hockey’s attempts to ‘fix the budget’ (if it was ever broken) seem to be going backwards, but it could be worse. We could be Russia, sliding towards another currency crisis. The Russian ruble has fallen nearly 50% in the past couple of months, dropping off a cliff in recent days. This chart from Bloomberg tells the story. This seems to have been driven by a collapse in oil prices – half of Russia’s exports come from energy – but there’s an air of the panics about all this. As a result, the Russian central bank jacked up rates by a massive 6.5 percentage points, from 10.5% to 17% – overnight! So now the poor Russian have an emerging currency crisis on their hands, together with European sanctions and now interest rates at 17%. Watch this space. This could be one of the big stories of 2015. But as always, it’s a good time to be an Aussie. And I’m grateful I’m in the property game. Property continues to be a solid and steady performer, even through the most uncertain times. It is quickly becoming the only safe-have on choice, as Gold struggles to pick itself up off the floor. And 2014 was the year of the Bitcoin revolution – with market loyalists quickly stamping out the crypto-currency rebellion. Bitcoin spiked in a bubble, but has since collapsed, to be the worst performing $US asset of the year – even worse than the Russian Ruble! Australian property on the other hand, continues to be a star performer. House prices in Sydney have now risen 28% in the past 18 months. And that’s something the state government of NSW will be extra grateful about. Stamp-duty revenues have gone through the roof. They’re up a whopping 85% over the past 18-months to $6.1 billion. Yes that’s billion with a ‘b’. And that ‘b’ is why we’ll won’t be seeing the back of this stupid tax any-time soon. State governments are hooked on the stamp-duty sugar. But don’t let me bring that Grinchy vibe to Christmas. The truth of it is, that for me, 2014 was a year well-lived. The world might not be perfect, (never has been and probably never will be), but through it all, life has been very good to me. I drank deeply of the company of my friends, families and loved one this year. I had the financial freedom to follow my passions, and throw energy into projects that really moved me – not just the ones that got my accountant salivating. And at the end of the day, I think I left the world a better place than when I found it at the end of 2013. I hope that I’ve helped my students (and you) on the journey towards financial freedom. And I hope I’ve helped you get a better feel for where property fits in the economic landscape, and the forces that affect it. And I hope that you’ve found something useful in my ramblings about success and psychology and the radical responsibility of determining your own future. And even if you thought it was all a crock of shi$t, at least you have a firmer picture of what you know you know, right? Anyway, I hope your year was as rewarding and as satisfying as mine was, and that you have just as many things to be grateful for. I hope you get some time to reflect on it, in the company of your loved ones, this Christmas. Personally, I’ll be unplugging the lap-top and taking a bit of down time to do just that, and the Knowledge Source office will be off-line until Jan 12. But we look forward to working with you all again in the new year. Have a joyous and rich Christmas everyone.